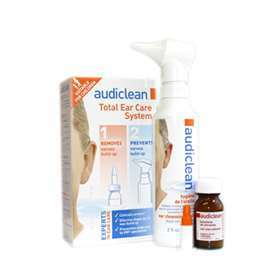 Audiclean Total Ear Care System removes earwax and prevents further build up. Audiclean is endorsed by ENT (Ear, Nose and Throat) Specialists, the ingredients are 100% organically sourced and the product is clinically proven. 60ml Ear Cleansing Wash for the prevention of ear wax build up. Safe alternative to cotton buds. Audiclean now offers the total solution to help remove and prevent earwax build up. Clinically proven, it gently and effectively softens and removes excess or hardened earwax. The Ear Cleansing Wash can then be used to safely cleanse the area to prevent further build ups. To Remove Earwax Build Up: With head tilted, fill the ear with a few drops of Audiclean Earwax Remover. Straighten head and leave to act for 25 minutes. Wash the ear with Audiclean Ear Wash. Repeat 3 times a day until symptoms clear. Treatment usually takes 2-3 days. If symptoms persist, consult your healthcare professional. To Prevent Earwax Build Up: Keeping your head upright, insert nozzle of Audiclean Ear Cleansing Wash into ear. Depress for one second; leave solution in ear for at least 10 seconds. Tilt head to drain, then dry ear gently with a clean towel. Cleaning ears 2-3 times a week with Audiclean Ear Cleansing Wash will help ensure wax build up does not return. If symptoms persist consult a healthcare professional.